Hello! Welcome to my little store in cyberspace! 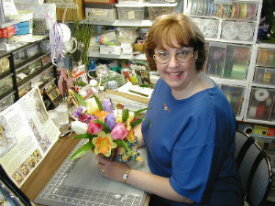 Affordable silk floral arrangements are what you will find here in my cyber-store. The pictures on these pages are examples of some designs I have done. Custom work is what I do best! I can do styles and sizes to suit your needs. There are prices to fit any budget. Tell me your ideas and together we will come up with a design that is just what you are looking for. In my store you will find many different handcrafted silk floral items. * DECORATED GRAPEVINE WREATHS in many sizes...all handwoven by me every spring. * DECORATED STRAW WREATHS...tell me your ideas and I will create it for you. * SILK-LIKE PINE WREATHS...decorated for the Holidays in colors and styles to fit your decor. * DECORATED GRAPEVINE TWIG SWAGS...bundles of grapevine twigs handtied into a unique looking swag. * DECORATED EUCALYPTUS SWAGS...Fragrant branches handtied together to form a swag and then adorned with a special bow in your color choice. * FLOWER POT GIRLS...Flowers with faces "planted" in a handpainted mini flower pot. Sure to put a smile on everyone's face! * MINI METAL CANS...Brass, Antique Copper or Tin cans in several different styles. These will brighten up a small table or desk. * BASKETS...several styles to choose from in many sizes. Please visit my other webstore for knit & crocheted items for babies, kitchen, bath and home decor. Plus fabric photo ornaments that are sure to become family treasured heirlooms. This is a wreath I designed for a customer. It is an oval grapevine, made by hand. A hand tied vertical twig swag hangs on each side. The flowers are Hunter green and Burgundy. 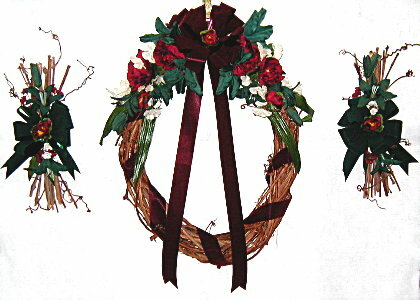 The ribbon wraps and bow on the wreath are made from Burgundy velvet-like ribbon. The bows on the swag are made from Hunter velvet-like ribbon. Very elegant and rustic at the same time! I have many styles to choose from. Come on in to the store and take a look around!